This soundtrack features 18 songs as heard in the film including familiar hit recordings (“Heartbreak Hotel,” “Are You Lonesome Tonight?”), powerful vocal performances (“That’s All Right,” “Tomorrow Is a Long Time,” “Trouble/Guitar Man”) and rare outtakes (“Suspicious Minds,” “Separate Ways”). Elvis Presley: The Searcher (The Original Soundtrack) is also available on 2-LP and 3-CD configurations. First of all, I have to say that the HBO documentary "The Searcher" was second to none! I anticipated the April 14th premiere like a child waiting for Christmas morning! It's a must-see for all Elvis fans. I did not think it possible, but my appreciation for Elvis Presley's immense talent grew after viewing this documentary. I have read EVERY book written by Elvis' friends/family, seen all previous documentaries, watched his movies, and own nearly 50 albums (and countless CD's for my car). I am 45 years old, and was nearly 5 years old when he passed. I have been a true Elvis fan for my entire life. "The Searcher" was a truly unique, honest, and true representation of the man and his music. For those who feel like they've already seen or heard Elvis' story, I encourage you to watch this documentary. I was so very impressed. I purchased the 3 CD set and have listened to it over and over again. The songs will not be new to an Elvis fan, yet some recordings have an edge or different feel to them. What an experience listening to Gladys Presley sing and hearing Elvis' versions of previously recorded songs! It simply does not matter the song, Elvis' version far surpasses the original... hands down...each and every time. I am happy to have added "The Searcher" 3CD set to my already impressive collection. Outstanding documentary...brought tears to my eyes as all concerts/documentaries always have. Thom, Priscilla, and Jerry should be commended in addition to finding themselves very happy with the finished product. I will own this on DVD one day! 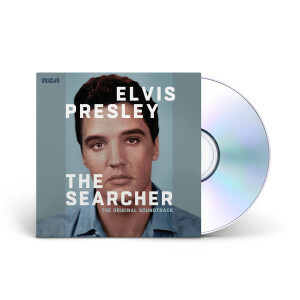 THE SEARCHER was a fine collection of some not so often heard song by the King. Others were different versions then the original releases. Overall it was a wonderful new collection and worth the listen.